This list of tofu recipes is all vegetarian and mostly vegan. ﻿Tofu is a great option for anyone looking for a low-fat way to get a protein boost. There's no limit to what you can do with tofu, from tofu stir-fries to smoothies. Don't forget to press your tofu for most recipes, and, if you're hesitant about cooking with tofu, here's everything you need to know about tofu. You might also want to check out my tips for what to do with silken tofu or check out these other great ways to get protein on a vegetarian diet. These recipes are all about the tofu. Baked tofu, marinated tofu, tofu in sauce and fried tofu! Most of these tofu recipes, however, are not a full entree or meal on their own. You'll want to pair them with rice or noodles, or toss them into a salad or stir-fry. Tofu takes center stage and stars in these vegetarian and vegan entrees. Using tofu instead of meat makes these recipes lower in fat and nearly absent of cholesterol. Try tofu lasagna or tofu lo mein! It's the most important meal of the day, so why not start it off with a soy protein boost? Check out these filling and nutritious vegetarian breakfast recipes using tofu, including smoothies with tofu, tofu breakfast burritos and of course, tofu scramble recipes. 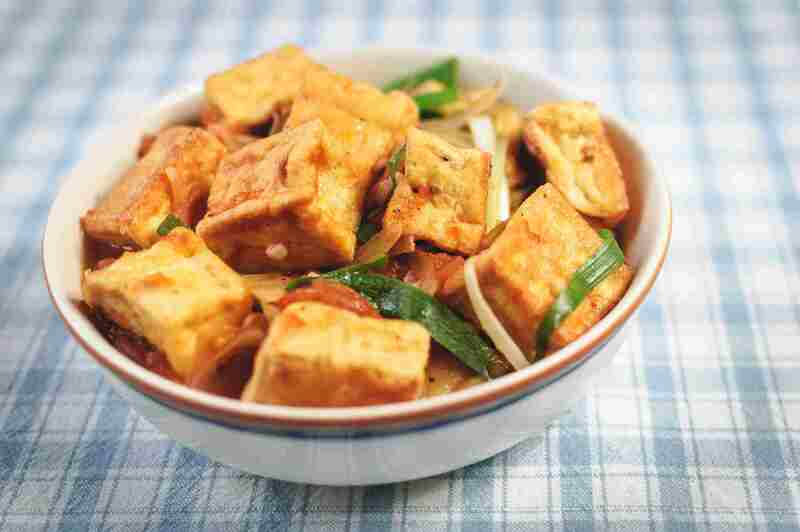 Tofu stir-fry is a quick and easy meal that most people enjoy. Combine your tofu with a few spices or make a quick sauce, add a few veggies, steam some rice or cook up some quick noodles, and you've got a full meal! Viola! Some quick tips for grilling tofu as well as a variety of grilled tofu recipes to try, from simple marinades to fancier spice rubs and sauces. No vegetarian barbecue is complete without some grilled tofu! When making desserts using tofu, most recipes will call for silken tofu, rather than firm or extra-firm tofu. This makes a big difference, so be sure you've got the right kind of tofu! Though it may seem a bit odd to make creamy desserts out of soy bean curd, the tofu usually just acts as a carrier for all the other amazing flavors, in place of dairy, or heavy cream. Silken (sometimes called "soft") tofu is great to keep on hand, since you can buy the shelf-stable containers which keep foor a long time. If you keep two or three boxes of silken tofu in your cupboard, you'll always be halfway to a vegan dessert, a creamy vegan sauce, a protein shake or a baked breakfast casserole. Browse through this silken tofu recipe collection for dozens of ways to use silken tofu to add a bit of soy protein to your meals. What an amazing food! Tofu can be transformed like magic into a variety of dairy substitutes, sauces, dips and more. Check out these recipes to find out how. If you're new to cooking with tofu, I highly recommend that you check out some of these helpful tofu resources to learn the tricks of the trade. Learn how to press tofu, when you might want to freeze it, the different types of tofu and just how healthy it is! Fried Tofu Sticks: Perfect for Kids!